Prestwick has relied heavily on Ryanair flights, which have been cut back sharply in the past two years, as the airline moved business to Edinburgh. New Zealand-based Infratil said the sales are the result of a decision to refocus where it plans to invest. It has also decided to sell Manston. Prestwick Chief Executive Iain Cochrane said “Prestwick is a great airport with a great team and a great future. I believe this is an excellent opportunity for us to attract new investment into the airport to provide the stimulus for future growth.” In reality Prestwick saw a drop of nearly 20% in passenger numbers in July 2011, compared with the same month last year. Passengers for all of 2011 were around 1,295,600, down -21.9% on 2010. This is down hugely from the 1,817,200 or so in 2009. Infratil, an infrastructure investment company, has said it is also looking for a buyer for its other British airport in Kent. New Zealand-based Infratil said the sales are the result of a decision to refocus where it plans to invest. Glasgow Prestwick Chief Executive Iain Cochrane said: “At the Infratil Investor Day today in New Zealand, it was announced that Infratil intends to sell both Glasgow Prestwick and Manston Airports. He continued: “Prestwick is a great airport with a great team and a great future. I believe this is an excellent opportunity for us to attract new investment into the airport to provide the stimulus for future growth. Prestwick Airport saw a drop of nearly 20% in passenger numbers in July 2011, compared with the same month last year. The Ayrshire airport’s owners said there were 37,800 fewer passengers during the crucial first month of the school summer holidays. In recent years, the number of passengers at Prestwick topped 230,000 during the month in both 2007 and 2008. The airport has had several owners in recent years. 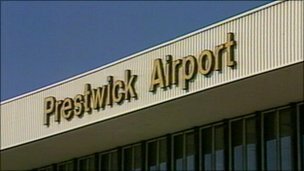 In 1991 the newly-privatised British Airports Authority, BAA, put Prestwick on the market. In 1992 the airport was bought by Canadian businessman, Matthew Hudson. He sold it in 1998 to transport group, Stagecoach. Stagecoach then sold it to Infratil in 2001 for £33.4m. A significant percentage of the airport’s aviation revenue is derived from freight and other aircraft activity, with business and property income also playing a significant role. 2011 around 1,295,600, down -21.9% on 2010. Posted: Friday, March 9th, 2012. Filed in News about Airports, Recent News.